NOTE: Polls for the first round are now closed. Well, ’tis the season for tournaments dealing with 64 of…something. The Air Force has one for Best Marches, Nintendo World Report has one for Best Video Games on Nintendo systems, and, of course, there’s that little basketball tournament that’s happening right now. But we’ve got something that I’m sure will entice the whole lot of you. Today, we present to you the first-ever Operation Madness. This year, we celebrate some of the best villains to have appeared in RPGs. The 64 villains involved were selected by the staff. We locked the entire staff in a small room at a hotel in Sri Lanka. Food and water had to be dropped in by the Air Force while we deliberated on who would make it into the tournament. The only contact we had with the outside world was a bouncer named Bubba, who not only kept us in our place but kept spies out. …Or we just did a poll and took the 64 from there. One thing to note—these are not necessarily the 64 villains who were highest-voted. A few who were outside the top 64 were included to provide a wider range of support to games. Pretty much every series that had a nominee in our poll is represented. 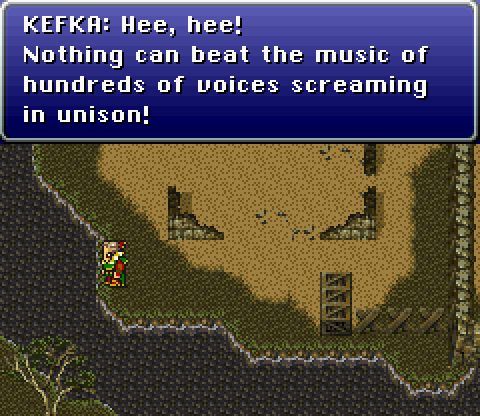 Is it any surprise that Kefka would take the top seed? The guy is a madman who attacks anyone who gets in his way, including his own king. He will take on the 16th seed, GALAM from Cosmic Fantasy 2. The winner of that game will go on to face the winner of the 8-9 match up. It will feature Devil Survivor‘s Naoya, the reincarnation of Cain. He will be up against a picture of honor and loyalty in the Black Knight himself, General Zelgius from the Tellius Fire Emblem games. 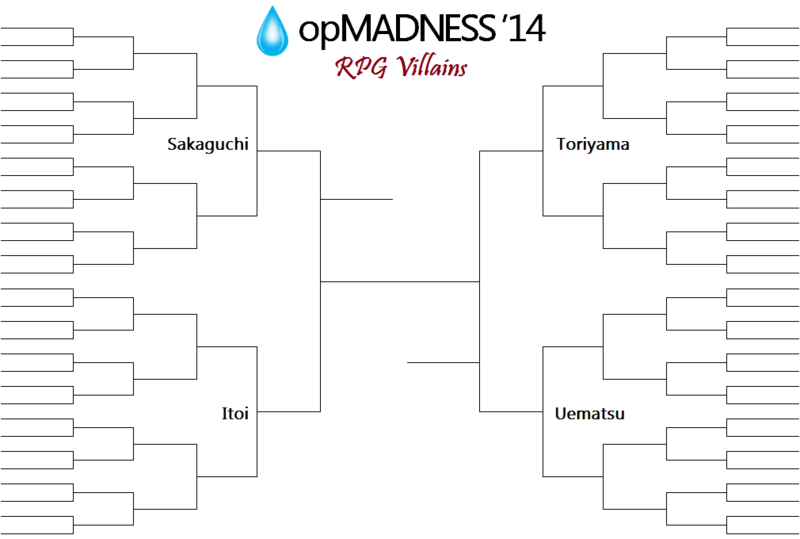 The 5th seed in the Sakaguchi bracket is Xehanort, the villain out of the Kingdom Hearts series. The man obsessed with Kingdom Hearts will go up against a man obsessed with beauty, Lysandre from Pokemon X & Y. The 4th seed is Ghaleon from Lunar: Silver Star Story. The Magic Emperor will be up against Dark Falz, the recurring villain of the Phantasy Star franchise. Smithy from Super Mario RPG: Legend of the Seven Stars is the 6th seed. The evil blacksmith will find himself caught in some muck as he faces off against the always disgusting Master Belch from EarthBound. The 3rd seed, out of Xenoblade Chronicles, is the mighty Zanza. The one-time scientist turned god will be wielding his Monado against the disturbing Nene from Blue Dragon. Skeith, the Terror of Death, from .hack is the 7th seed. He will have his hands full with Ozzie, one of Magus’s three generals from Chrono Trigger. The number-2 seed, out of Secret of Mana, is the evil Thanatos. The sorcerer will face off against CFW Trick, the incarnation of our gaming frustrations from Hyperdimension Neptunia Mk2. That’s the way it is in the Sakaguchi group. But we still have three more to go.